Hannan’s Kevin Morehart (6) makes an attempt to catch a pass as Cameron defender Travis Mickey (7) looks on during Friday night’s football game in Ashton, W.Va.
ASHTON, W.Va. —The highlight of the Hannan High School football team’s season finale on Friday night came after the game. The Wildcats began a new Senior Night tradition, which featured all of the players walking — hand-in-hand and to music from one end zone to the other — with all of the seniors trekking the final 50 yards. By then, they were battered and bruised — after being blanked by the visiting Cameron Dragons 65-0 inside a wind-ridden Craigo Athletic Complex. The Dragons simply dominated from the opening whistle to the final snap, which included the second half —with Cameron commanding a 47-0 halftime advantage — being shortened to two eight-minute quarters and with a continuous clock. With the win, the Dragons —which were seventh in the latest release of the Class A football computer ratings — completed their regular season at 9-1. Their only setback was to Shenandoah, which lost at Ohio Valley Conference champion Coal Grove 7-6 on Friday night in the Ohio High School Athletic Association Division VI regional quarterfinals. Hannan, which played 10 regular-season games for the first year in four, ended its season at 2-8. 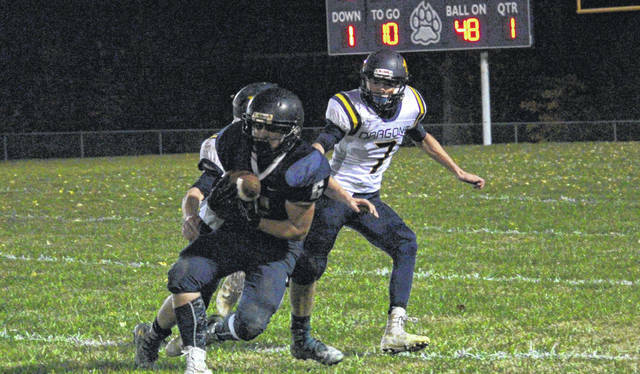 The Wildcats won 41-0 at Hundred in week four and 41-8 two weeks later over Jenkins (Ky.) for a two-game win streak, but Hannan fell victim itself to five shutouts, while scoring only a touchdown apiece in the other three setbacks. The Wildcats lost the opening three games, then closed the season with a five-game skid, including their two worst losses of the season. Friday night’s result surpassed Hannan’s 50-0 shutout against Phelps (Ky.) for its worst defeat of the entire fall. And, Cameron almost got to 50 in the first half —and would have had it not had three extra-point kicks get blocked. The Dragons dialed up for 20 first-quarter points and 27 more in the second, followed by a pair of touchdowns in the third and finally a Noah-Neely 4-yard run with two-and-a-half minutes remaining. After all three second-half scores, Cameron lined up for the two-point conversion attempt, but quarterback Colby Brown took a kneeldown each time. Otherwise, Cameron could have hung Hannan for 70. Before Brown took his knees, he burned the Wildcats with his arm and his legs. The six-foot, four-inch 200-pound senior signal-caller completed six touchdown passes —all of which went for at least 21 yards. He only threw three incompletions on 15 attempts, and racked up 249 passing yards. With 6:49 remaining in the second stanza, he sprinted 34 yards for a touchdown on his only rush to make it 33-0. Travis Mickey made five receptions for 92 yards, while Andrew Ritchea caught three balls for 68 and Robert Milliken two for 62. Mickey and Ritchea recorded two receiving TDs, while Milliken made the first with Trey Scott hauling in the other from 24 yards away. Wyatt Wingrove, who ran in the two-point conversion on the opening score, later kicked three extra points. Ritchea, in rushing for 158 yards on a dozen tries, easily outgained the Wildcats (132) by himself. His 70-yard scamper made it 40-0 with three-and-a-half minutes left before halftime. His only carry of the second half, part of only six plays from scrimmage for Cameron in the final 16 minutes, was a 55-yard dart to the 5-yard line to set up Neely’s two totes. The Dragons doubled up the Wildcats in first downs 16-8, had 200 more passing yards (249-49), and amassed 446 total yards on 30 plays from scrimmage. The 10 penalties for 105 yards were no worry either. That’s because they answered each Hannan first-half possession —which included a three-and-out and seven-yard punt, an interception, a fumble and four turnovers on downs —with five Brown touchdown tosses and the scoring runs by Brown and Ritchea. Scott returned the opening second-half kickoff 82 yards to make it 53-0, as two more Wildcat drives ending on turnovers on downs were answered with a pair of three-play scores by the Dragons. Brown’s second 28-yard touchdown completion, with 3:16 in the third, made it 59-0. His other four scoring aerials went for 21, 23, 24 and finally 30 to Ritchea with 1:07 before halftime. The Wildcats were already without nine players on their roster for Friday night, then a few more got injured and knocked out, including quarterback Matthew Qualls. He completed 3-of-7-passes for 34 yards, as Christian Holland —who paced Hannan in rushing with 35 yards on 13 carries — had to take over under center and completed 1-of-5 passes for 15 yards. The Wildcats, with a dozen different individual ballcarriers, rushed for 83 yards on 40 snaps. The Blue and White are now 6-17 in their last 23 season finales.